CAMBRIDGE, Mass.--(BUSINESS WIRE)--Feb. 13, 2018-- Catabasis Pharmaceuticals, Inc. (NASDAQ:CATB), a clinical-stage biopharmaceutical company, today reported new positive efficacy and safety results showing preservation of muscle function and sustained disease-modifying effects in boys with Duchene muscular dystrophy (DMD) in the MoveDMD trial open-label extension following 48 and 60 weeks of treatment with edasalonexent. Consistent improvements in all assessments of muscle function were observed after more than a year of oral 100 mg/kg/day edasalonexent treatment compared to the rates of change in the pre-specified control period for boys prior to receiving edasalonexent treatment. Additionally, supportive changes in non-effort based measures of muscle health were seen, with significant longer-term reductions in muscle enzymes and C-reactive protein (CRP), supporting the durability of edasalonexent treatment effects. 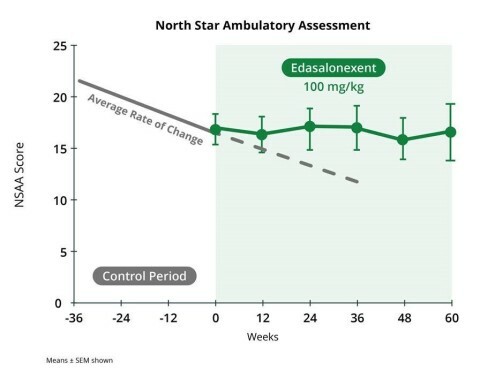 Edasalonexent continued to be well tolerated with no safety signals observed in the trial. These data will be presented on Saturday, February 17, 2018, at 14:15 CET at the XVI International Conference on Duchenne and Becker Muscular Dystrophy in Rome, Italy, and detailed at future scientific conferences. Additional supportive measures of muscle health also reinforce positive edasalonexent treatment effects in the 100 mg/kg/day treatment group. Four muscle enzymes (creatine kinase, alanine aminotransferase, aspartate aminotransferase and lactate dehydrogenase) were significantly decreased compared to baseline following edasalonexent treatment at 12 weeks and later time points through 60 weeks (p<0.05), consistent with the ability to slow muscle degeneration and improve muscle integrity. Biomarker results showed that CRP was significantly decreased with edasalonexent at 12, 24, 36 and 48 weeks compared to baseline in the 100 mg/kg/day treatment group (p≤0.001). CRP is a well-characterized blood test marker that provides a global assessment of inflammation, and CRP is elevated in boys affected by DMD. The significant decrease observed in CRP supports the biological activity of NF-kB inhibition by edasalonexent treatment decreasing inflammation. The MoveDMD trial is investigating the safety and efficacy of edasalonexent in steroid-naïve boys enrolled at ages 4 – 7 affected with DMD (any confirmed mutation). The trial is comprised of three parts - Phase 1, Phase 2 and open-label extension. Phase 2 was a randomized, double-blind, placebo-controlled 12-week portion with 31 ambulatory boys across a range of dystrophin mutations. The 12-week MRI T2 primary endpoint for treated boys compared to placebo was directionally positive although not statistically significant. The open-label extension evaluated longer term safety and efficacy using pre-specified analyses comparing the rates of change in boys receiving edasalonexent treatment and prior to treatment. In the Phase 2 and open-label extension of the MoveDMD trial, edasalonexent substantially slowed DMD disease progression in boys on 100 mg/kg/day through 60 weeks of treatment. Across all assessments of muscle function, consistent improvements were observed in the rate of decline after 12, 24, 36, 48 and 60 weeks of oral 100 mg/kg/day edasalonexent treatment compared to the rate of change in the control period for boys prior to receiving edasalonexent treatment. Statistically significant improvements were also seen across available non-effort based measures of muscle health. In the 100 mg/kg/day treatment group, 16 boys commenced edasalonexent either at the beginning of Phase 2 or at the beginning of the open-label extension. Edasalonexent was well tolerated with no safety signals observed in the trial. Catabasis expects to present additional data at scientific meetings in 2018. Any statements in this press release about future expectations, plans and prospects for the Company, including statements about future clinical trial plans including, among other things, statements about the Company’s plans to commence a single global Phase 3 trial in DMD in the first half of 2018 to evaluate the efficacy and safety of edasalonexent for registration purposes, the Company’s plans to report top-line results from this trial in 2020, and other statements containing the words “believes,” “anticipates,” “plans,” “expects,” “may” and similar expressions, constitute forward-looking statements within the meaning of the Private Securities Litigation Reform Act of 1995. Actual results may differ materially from those indicated by such forward-looking statements as a result of various important factors, including: uncertainties inherent in the initiation and completion of preclinical studies and clinical trials and clinical development of the Company’s product candidates, including the final trial design of the Company’s planned Phase 3 trial in DMD; availability and timing of results from preclinical studies and clinical trials, including the availability of top-line results from the Company’s planned Phase 3 trial in DMD in 2020; whether interim results from a clinical trial will be predictive of the final results of the trial or the results of future trials; expectations for regulatory approvals to conduct trials or to market products; the Company’s ability to obtain financing on acceptable terms and in a timely manner to fund the Company’s planned Phase 3 trial of edasalonexent in DMD for registration purposes; availability of funding sufficient for the Company’s foreseeable and unforeseeable operating expenses and capital expenditure requirements; other matters that could affect the availability or commercial potential of the Company’s product candidates; and general economic and market conditions and other factors discussed in the “Risk Factors” section of the Company’s Quarterly Report on Form 10-Q for the period ended September 30, 2017, which is on file with the Securities and Exchange Commission, and in other filings that the Company may make with the Securities and Exchange Commission in the future. In addition, the forward-looking statements included in this press release represent the Company’s views as of the date of this press release. The Company anticipates that subsequent events and developments will cause the Company’s views to change. However, while the Company may elect to update these forward-looking statements at some point in the future, the Company specifically disclaims any obligation to do so. These forward-looking statements should not be relied upon as representing the Company’s views as of any date subsequent to the date of this release.